The international shipping has begun in the second round of the For the Love of Solids swap, and I am just bowled over by some of the seriously awesome pieces that folks are finishing up and sending out. See what I mean??? I love how enthusiastic this group is. You should seriously come visit the Flickr group to check out all the solid eye candy! I really, really love pouches. I get so many compliments on this gorgeous one that I use every day - Michelle made it for me in the first round of the Pretty Little Pouch swap earlier this summer. Thank you, Michelle, you rock!!! I've been kicking myself over not joining the second round of the Pretty Little Pouch swap, which is in the midst of wrapping up, so I decided to make myself a pouch for my hand-sewing tools. I totally intend to use this pouch to tote my embroidery things around the house and to the Sewing Summit in less than two months (eek!). Have you seen the awesome Travel Handmade series that they're hosting? Jeni reviewed a great Simplicity duffel bag pattern and Megan reviewed a great tote bag pattern. Megan and I are toying with the idea of an AB Weekender Bag sew-along for the two of us, because we both really want to make one for our big trip, and figure we can use all of the moral support we can get! 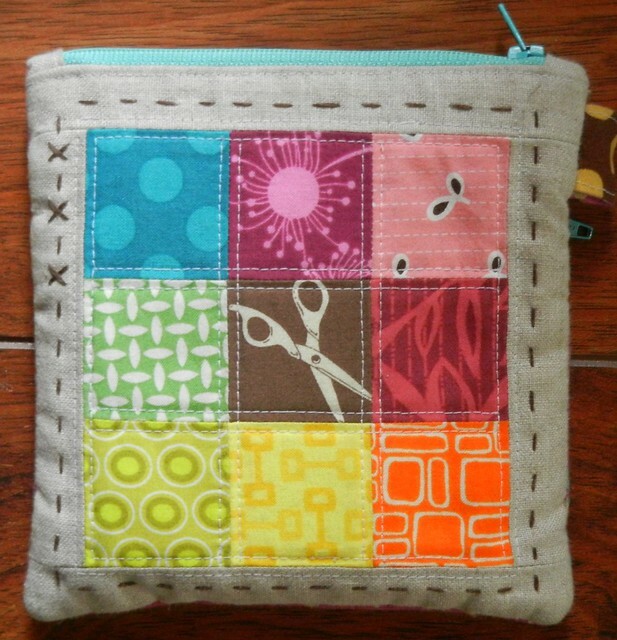 So, after drooling over all of the gorgeous pouches in this round of the Pretty Little Pouch swap, I decided to make one for myself, to tote all of my hand-sewing and embroidery do-dads around. I picked out a fabulous stack of aquas (Riley Blake Wishing Flowers, Joel Dewberry Herringbone, It's a Hoot Aqua Check and Michael Miller Aqua Ta Dot, respectively), grays (both Ty Pennington), and a fun orange Katie Jump Rope print and got to work. 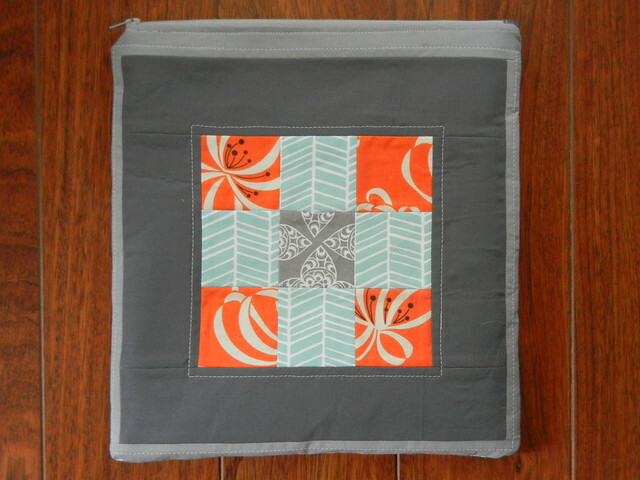 I made my current favorite quilt block for the front side, and then for the back side, I stitched up a simple 9-patch and bordered it with some Kona Coal and Kona Medium Grey. I am loving this not-so-little pouch! 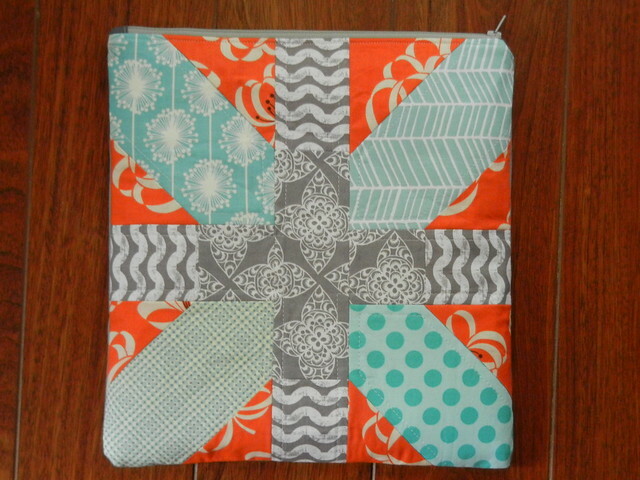 It finished up at 12" square, so it will be plenty big for my embroidery hoop and various other hand-sewing goodies. I also stitched up a pouch for my For the Love of Solids swap partner, using the same color scheme that I used for the miniquilt I'm also finishing, and I'm pretty happy with how it turned out. I've stuffed it chock full of solids scraps, and I'm hoping this lovely package I'm putting together is going to really make my partner's day, when shipping opens up next month. For the weekend, I'm working on laying out the rest of my warm/cool quilt, which I've been working on in fits and starts all summer. 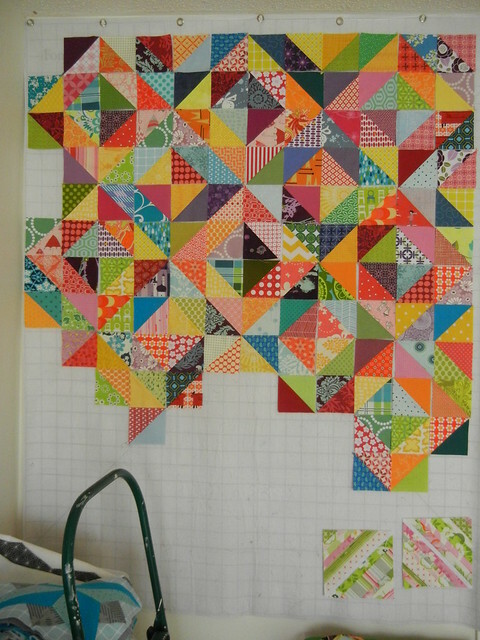 I'm hoping that perhaps over the next week, I might actually finish this quilt top up once and for all. Fingers crossed! What are you working on this weekend? It's a quiet Saturday morning at my house, and my iron's heating up, the washer is humming away, and I've already finished vacuuming for the day. The boys are out having a "boy adventure" on a local war victory ship, and I've got the house to myself for some heavy-duty cleaning and some sewing time. Did you whisper that to yourself, like Haley Joel Osment in "The Sixth Sense"? I did, when I started typing...but I digress...These lovelies are sitting on my ironing board, just waiting to become something wonderful for my partner in the For the Love of Solids swap. I'm looking forward to some quality time with my sewing machine this weekend! What about you? What are your weekend plans?